“I first met Peter when my younger brother’s girlfriend worked for him as a receptionist about two years after he started his business. My brother had a T-bucket and Peter came over and saw it and immediately fell in love with hot rods. We were introduced and I was looking for work at the time, so he put me on,” Adam explained. “I started off in the wash bay and driving trucks and it just evolved from there. The more we spent time together the more we got along, and we really found that common interest in motorsport and started racing together – Peter in his little green Capri with Cabbage Racing on the door and myself in a pink Torana he helped me find. We used to go racing at Bodangora Drags in Wellington. Soon Peter stepped up to his Supercharged Outlaws car. He had Maurice Fabietti do the engine work on it and I used to maintain it and keep it running. We qualified first a few times in that car and Pete was really comfortable in it and I think that is what pushed him to Top Fuel because he really, really loved the dragsters. The purchase of that first Top Fuel package began a new chapter in their friendship. “Pete brought it home and set it up and every Wednesday everyone would come over and we would go through it. I always wanted to learn about it but I kind of stood back, but when Pete wanted to get in the saddle himself and start racing that was when I got involved,”. With almost two decades of friendship under their belts, there is no doubting the pair are close. “PremiAir Hire is a real family environment and you get to know people really well, sometimes more than your own family, as you are side by side with them day in and day out,” the 49 year old said. “As the Workshop Manager I am in charge of around eight people and I look after all of the service technicians, the wash bay and equipment turnaround, the fleet and also customer service. We are always just doing the very best that we can. 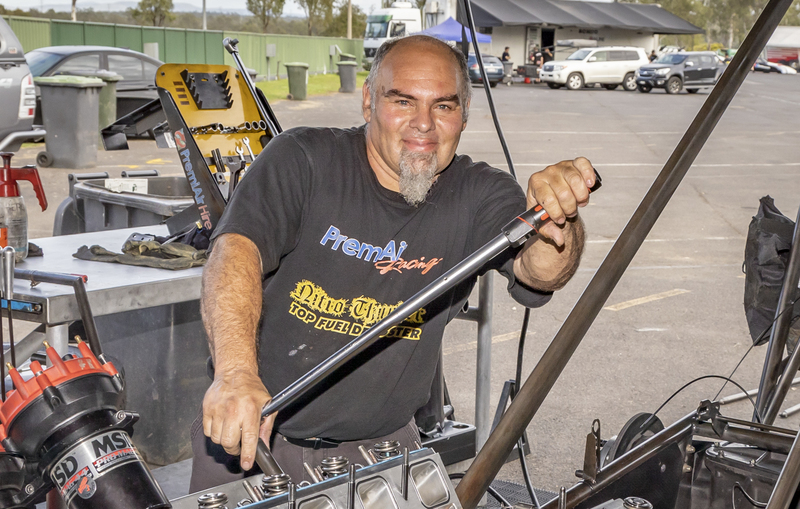 “At the track, I look after the right hand side of the engine and help with servicing, set-up, pack-up and so on and between events if I can get to the service workshop I help as much as I can.